Mitchell’s grandfather has always had a gentle, quiet wisdom about him. My father died years ago and I never really had a template to pattern my life after – so I learned to watch. To this day, I watch everyone carefully and take quiet, deep notes. Sometimes I write my notes in pencil, other times I write in pen. This was a day I wrote in pen. On this occasion, my in-laws came to our family’s ranch in Southern Utah, which aside from our home, was one of Mitchell’s favorite places to be. 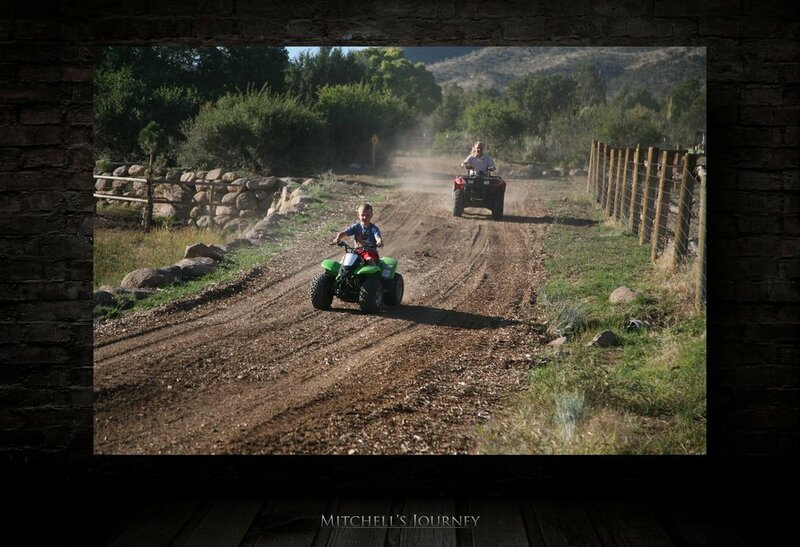 Mitch was excited to show his grandfather around the ranch on some 4-wheelers. Grandpa asked Mitch to take the lead, and that he would follow. Mitch smiled as he mounted his little 4-wheeler and carefully scootered about. He felt responsible and empowered – and little Mitch grew because of it. I saw a look of leadership in my son’s countenance that day and my heart swelled with love and gratitude. To me, this image is a symbol of good parenting, and I have my father-in-law to thank for the reminder. In the past, I often observed my father-in-law present his grandchildren 2 or 3 options and invite them to make a choice. I don’t know if it is intentional, but he does it often, so I am sure it must be. Over the years I captured several such moments where Dee would ask little Mitch what he wanted to do … and my son would furrow his brow, think deeply and then decide on a thing. What my father-in-law was doing was teaching my son to think for himself and learn to have confidence in his decisions. Without realizing it, Natalie has often modeled her parenting style after her mother and father. Like her dad, she nurtured a sense of empowerment in our children. She would often say to our kids things like, “You can always make a choice, but you cannot choose the consequence,” warning them to think carefully before they act. Natalie often took the slower, but more effective method of parenting; always offering loving guidance, but allowing the natural consequences to follow, for better or worse. She did this so they would learn while they were young how much their choices mattered. She gave our kids options, so they could learn wisdom through trial and error and to eventually become confident in themselves. Surely there have been scraped knees and bruised egos, and sometimes things didn’t turn out how we hoped but, on balance, allowing our children to lead and make choices has helped them grow. So, when I look back on this beautiful summer morning when Mitch felt like the king of the world, I am reminded of the importance of raising children to feel empowered, not entitled. I’m reminded of the tremendous growth that happens when we take the time to teach our kids, then allow them to lead. My little son is leading me now, from a distant place far from view. I am watching and listening … and writing with pen.